Productions that require voice-overs often connote relying on professional talent and tools to get the job done properly. After all, it requires certain nuances in speech, voice delivery, and other factors in order for it to fit the narrative or production that it would be incorporated in. With the Narrate app, though, you won’t have to rely on these various elements because it pretty much provides you with all you need to help add professional-sounding voice-overs to your projects. Narrate capitalizes on providing quality voice-overs to video productions with special focus on making sure that it can be done in a breezy, quick step-by-step manner. Upon launching, you would be asked to select videos stored in your device. You can preview each one, and each video’s respective durations would be displayed as well. After selecting, you can then proceed to tap the Narrate’ button located on the upper-right hand corner of the interface to head on over to the succeeding step. The Narrate portion of the app is certainly what makes this app noteworthy. 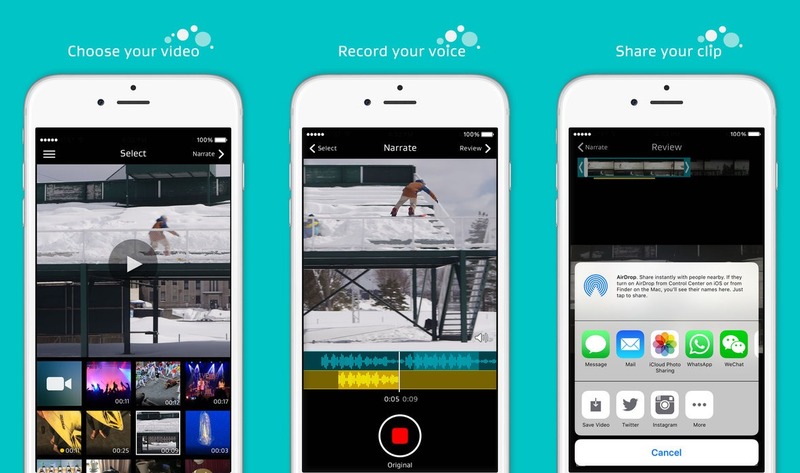 After all, not only does it let you add a voice-over narration of the video of your choosing, but it also allows you to edit your recording once it has been added. With its adept mixing features, it becomes possible for most users to seamlessly mix their voice-over with the natural soundtrack of the video or even other audio files that you’ve chosen to add to it. What makes things even greater is the fact that this app allows you to adjust how you sound by adding voice effects. Whether you want to sound funny or scary, this is one easy way to do the job. The app allows you to save your original recorded audio, giving you complete freedom to add new twists to it and exercise your creativity to the fullest. Once you are done, you can review your complete creation anytime. As said above, Narrate is made completely different from other apps of its kind by its focus on providing as much user convenience to its users as much as possible. This same feature simply can’t be attributed to other apps that serve a similar purpose, considering the utter complexity of some of them. There is also an apparent rarity of apps that focus on voice-overs, thus our arrival at such a conclusion. Telling a wonderful story, especially if it is intended to be read out loud, requires an equally compelling and engaging storyteller. The same practically goes if you want to deliver a great punch line. Rest assured that this app pledges nothing less than its full support in helping you achieve this.